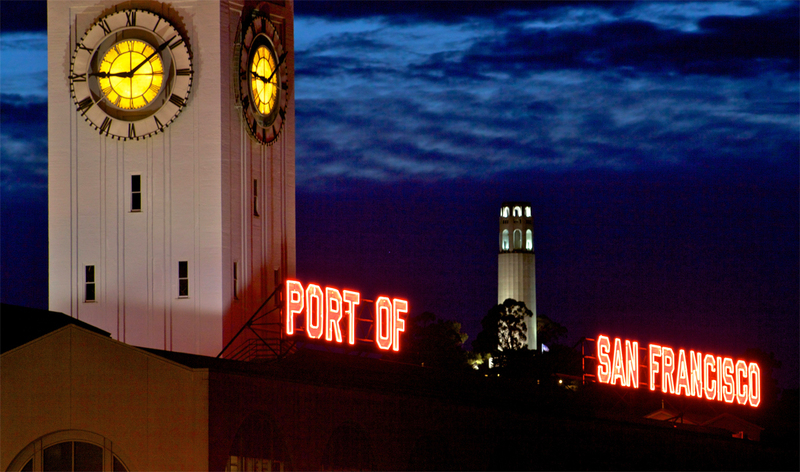 With Coit Tower rising between its glowing letters, the majestic Port of San Francisco sign welcomes everyone to the City. Carlos Club in San Carlos (left). Night Cap lounge, S.F. (right). 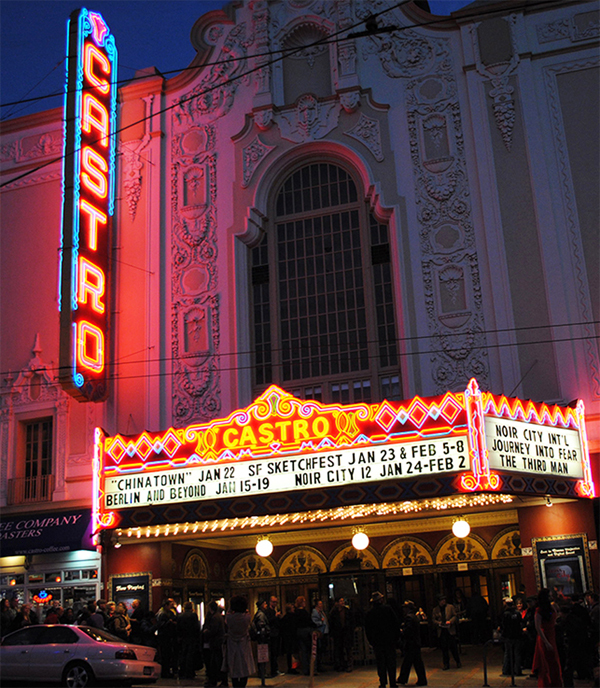 The legendary Castro Theatre, S.F. "Miraculously—and here also is a powerful symbol for urban renewal—most of the neon signs were in pretty good structural shape after more than a half century on the skyline," historian Kevin Starr wrote in the Los Angeles Times. "Some of them still had vestiges of their original gas." The effort has since spread to other parts of town, including the Broadway Theater District, and across the country as well, Lynxwiler says. In the theater district, he says, "Historic theaters are relighting their signs, one after another, even ones no longer theaters. There are lots of functioning theater marquees on Broadway, and it looks amazing." Restoring neon has spread because "it's been proven over time to help an area," Koga says. "It revitalizes a whole area. It brings new energy to an area." "It's gone from where owners would remove their sign because they hated it, to where people are calling and saying, 'We want a vintage sign for our building.' It's been successful in Los Angeles, and it's really spread across the country." 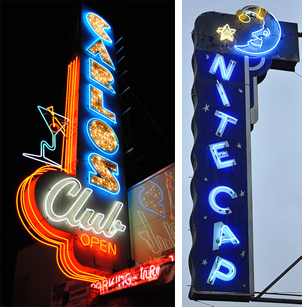 In San Francisco, neon proponents include Heritage, the preservation group that got its start focusing on Victorians but today promotes modernism and 'legacy' restaurants and bars as well. Heritage has even held a neon tour. Photographer Al Barna, who recently produced the book San Francisco Neon: Survivors and Lost Icons with his colleague and wife Randall Ann Homan, mentions several recent campaigns to preserve the city's neon. These include saving the neon marquee of the Bridge Theatre on Geary Boulevard, and on an old furniture store at Pine and Franklin streets. "We get phone calls from people," he says. "'You've got to save the Allstar Donuts sign down on Chestnut Street.' Well, it's not that easy." He's still smarting from the recent loss of the immense Sherman & Clay piano showroom sign on Mission Street, which he blames on a bureaucratic planning department error. "There's a surprising amount of neon still left in San Francisco. But it's not like it was. Old postcards showed that San Francisco could rival any other city with its neon." One "great success" Barna cites is the Nite Cap bar in the City's Tenderloin, an image of a sleeping moon wearing a nightcap, recently restored by new owners and quickly winning fans. "We were in there one night talking to them about the sign," Barna says. "We got so engrossed in conversation, they forgot to turn it on. People from the neighborhood came in and said, 'Oh, you need to turn on the sign.'" One city that has taken neon to its heart is Glendale, where the Museum of Neon Art, founded in 1971—the birth of the modern rebirth of neon—plans to reopen by the beginning of 2016. The museum has been dark since 2011 after vacating a space in Los Angeles. The museum, which focuses on neon as an art form and has about 100 neon works, plus photos and other items, will teach neon-making as well as display new neon art and vintage neon. "We're looking at this as an art," says Koga, who's been a neon artist since the start of the 1990s. "The signs are folk art, and we have very contemporary work, contemporary sculpture. We're not just about signs." MONA, as the museum is called, is in a city-owned building that will help anchor Glendale's art and entertainment district. At the other end of the strip is the neon-bejeweled Alex Theatre with "an amazing neon spire built back in the day. So there is a neon marker on the north end and a neon marker on the south end," Koga says.